Loes Thijssen is associate partner at NOAHH | Network Oriented Architecture. Substantiating NOAHH’s ambitions, she connects theoretical and conceptual frameworks to design practice. As head of the knowledge department, she leads large international research projects and workshops and is responsible for knowledge exchange and output. 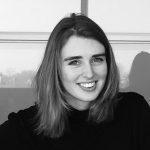 Additionally, Loes Thijssen, in collaboration with Patrick Fransen, manages complex architecture competitions.